Many famous scholars played the qin. 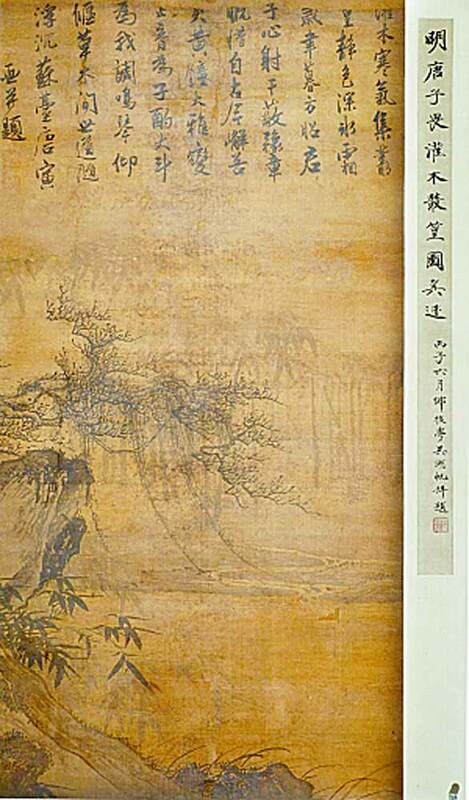 Some, such as Wang Wei, though best known as poets, were also painters. The skills of these artists are generally not known -- in fact some perhaps rarely or never played. However, given the connection between qin and art, it is interesting to further examine those artists who seem to have had a particular connection to the qin. This issue has not been a focus of my work, so at present names will be added here as I encounter them, rather than as a result of specific searches for such artists. Of course, suggestions will be appreciated. The focus is finding evidence of artists who played the qin. Wen Zhengming was one of the Four Gentlemen of Wu, four friends (including Tang Yin) who were poet-painters in Suzhou. Another friend was the qin player Yang Shousu. A qin apparently from Wen's household was later owned by the female Suzhou poet Xian Xian. Wen's painting Qin Player Among Plantain and Rocks is discussed in the article by James Watt. He had homes named 停雲館 Tingyun Guan and 梅華屋 Meihua Wu. See Giles, ICTCL, p.759, etc. There are quite a few references here to Qiu Ying, but I have not yet found direct evidence that he actually played qin himself. Chen. famous and with a very distinctive style, was perhaps the most notable literati painter to depict women playing the qin. He might be identified by style name (章侯 Zhanghou) or nicknames (老蓮 Laolian, 弗遲 Fuchi (弗遲老人 old man Fuchi), 雲門僧 Yunmenseng, 悔遲 Huichi, 遲和尚 Chiheshang and 悔僧 Huiseng). This page added 2007. Not yet properly developed: suggestions welcomed. Some sites of interest include these digital archives (see also the surrounding pages).